A melt in your mouth Flank steak that is grilled on the barbie and perfect for any cookout! An overnight marinade of soy sauce, red wine vinegar and garlic puts the flavor over the top for this cut of meat. 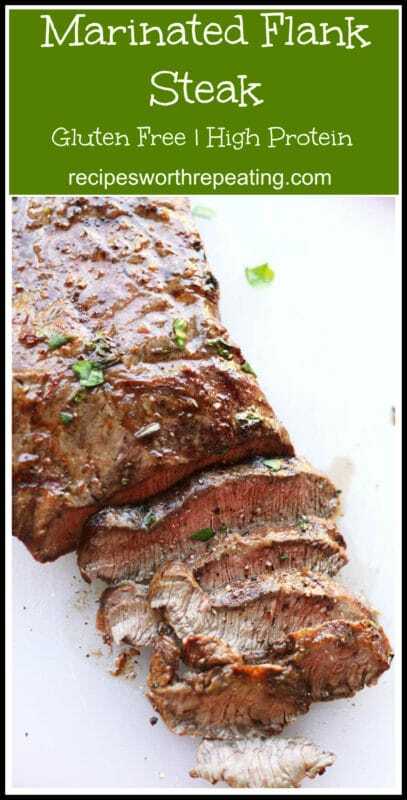 Oh my goodness this is a fabulous marinade recipe for Flank steak or Flat Iron steak. Guys, I’m talking HUGE flavor here! And, it’s so super easy to make this marinade! I got home really late last night from the gym…around 10:00pm. Because I do meal planning and since I do stick to it each week, I already knew what I was having for dinner the next night. Ya’ll, I’ve made this recipe so many times before, I knew I needed to get my steak in this scrumptious marinade the night before so it would have plenty of time to marinate. I threw my gym stuff down and started pulling the ingredients to make my marinade. I started whipping up my special marinade in a glass bowl. Then, I put the steak and marinade in a gallon size ziplock baggie and tossed it in the fridge so it could do it’s marination magic overnight. Speaking from experience, I recommend you marinate the steak for at least 12 hours before grilling. And by the way…let’s talk Flank steak versus Flat Iron steak for a minute so you can understand the difference. Flat Iron steak is cut from the shoulder and has nice marbling. It’s perfect for grilling. Flank steak is cut from the abdominal area and is a more tough cut of meat. Personally, I like Flat Iron steak more than Flank steak, but you can use whatever cut of meat you want. I find that Flat Iron steak is more tender and tends to melt in my mouth more than Flank steak, but that may just be preference. When I got home from work today, I pulled my marinated steak out of the baggie that was in fridge. The aroma was incredible…I could not wait to grill my steak! I let the steak rest for 10 minutes on a plate before I popped it on the grill. Let’s elaborate on this marinade, shall we? It’s full of flavor, but what really makes this marinade pop is the lemon juice, red wine vinegar, fresh minced garlic and Dijon Mustard. I’m telling you those four ingredients are KEY and pair so perfectly with the oil, soy sauce and Worcestershire sauce. After the resting period was over, I popped my steak on the grill and it was ready in 20 minutes. So easy and if you are a “plan ahead” kind of person, you’ll appreciate this recipe. Emeril’s Dijon Mustard is gluten free and is disclosed here. Still though, if in question do your research. One of my readers advised that Lea & Perrins is gluten free in the US, but necessarily in other countries. Malt vinegar is used in the recipe outside the US. When in doubt…do more research! Enjoy this recipe guys! You are going to LOVE it! Happy Eats! 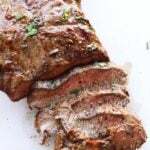 Oh…and if you are looking for other amazingly fantastic steak recipes, you MUST check out my 10 Garlic Clove Marinated Grilled Filet and my Steak with Creamy Balsamic Mushroom Sauce! So delish! Get ready for some amazing tasting steaks!! 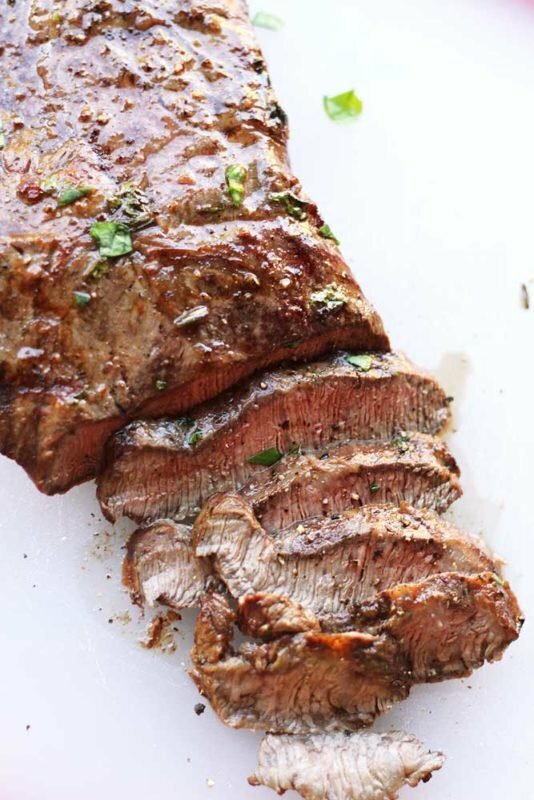 A melt in your mouth flank steak that is grilled on the barbie and perfect for your spring/summer cookouts! An overnight marinade of soy sauce, red wine vinegar and garlic puts the flavor over the top for this cut of meat. In a medium bowl, mix the canola oil, soy sauce, red wine vinegar, lemon juice, Worcestershire sauce, Dijon Mustard, garlic and pepper. Place the steak in a gallon size Ziplock bag. Pour marinade over the steak, mixing the meat so it's coated thoroughly. Refrigerate for at least 30 minutes, up to 12 hours. After the meat has marinated, remove the meat from Ziplock bag and let rest on a plate for 10 minutes. Preheat your grill to medium-high heat. Place the steak on the grill and sear on each side for 2-3 minutes. Grill meat for 7-10 minutes per side, or to desired doneness. This marinade is gluten free and if you are gluten free, make sure you read the labels of your soy sauce, Worcestershire Sauce and Dijon Mustard. Pin this Marinate Flank Steak Recipe to your favorite Dinner or Grilling Board! Definitely gonna try this one tonight! Awesome! The longer it marinates, the more tender and flavorful the meat will be! Thanks! I hope you have an opportunity to try it out! This is the perfect recipe for my meat lover husband! It look so easy to make as well, will definitely give it a try tonight! If he’s a meat lover, he’s going to love this one! The marinade is what makes this steak! My 7 year old who hates most foods even loved this one! This looks and sounds so yum! I’m always afraid of flank, because I tend to overcook it and it becomes tough. Looks like I’m going to have to try it again! I think you should try making it with Flat Iron Steak and see how you like it!! Flank is my favourite cut! Looks like you got it just right, love the marinade too. Good Job! Thanks! Yes, I prefer Flat Iron steak but regardless, this marinade makes a Flank cut or a Flat Iron cut so tender! Yummy! Steak is one of the best foods ever. Right!?! Thanks for your comment!! Hooray for grilling season! This marinade looks great – I’m totally craving steak now! Ha Ha! Glad I got your tastebuds wanting steak! Enjoy!! So excited for grilling season – Definitely using this recipe the next time I make flank steak! Hello. You should probably be specifying that gluten free Worcestershire sauce needs to be used. Regular Lea & Perrins Worcestershire sauce is not gluten free. A gluten free brand that we use is “The Wizard’s”. Just putting the marinade together now, will try tonight. Hi Mike! Thanks for writing me!! I’m excited to hear back from you on what you think about the marinade!! I looked up Lea & Perrins just now and they are gluten free. Take a look at their disclaimer here: http://www.leaperrins.com/Products/The%20Original%20Worcestershire%20Sauce. None the less, I will absolutely update the recipe to ensure readers know to read the labels of their Worcestershire sauce! LEt me know how that steak turns out! Thanks Amanda. I also did some quick reading, and yes, L&P is gluten free in the US, but not Canada (and I believe some other markets). Malt vinegar is used in the recipe outside the US. Hey Mike – that is SO helpful to know!!! Thanks for writing back to let me and the readers know! !